Seriously, it elicited a stronger reaction than if he had given me a 100 roses. I’ve been wanting to take a gap year every since talking to Noah and Jillian on the podcast, two people I know who have taken or are planning to take gap years. Jillian’s story is actually pretty amazing. I read her blog pretty regularly and her writing is raw and from the heart. That’s why I was so excited to hear she was launching a “plan your own mini-retirement” course. The purpose of the course is to prepare someone to take the leap into mini-retirement. Like legit prepare, step by step. This includes the financial preparation needed, the logistics, the dreaming part of it, the emotional support and everything else that comes with a mini-retirement. I have early access to the course and the format is videos and printables. It’s administered by teachable which is an easy to use platform. There are also bonus videos by other financial experts on travel, entrepreneurship, and retirement included at the end of the course. You also get support from Jillian and she’s super passionate about helping people realize their dreams. She takes it super, seriously. If you want to hear amazing free advice from Jillian, check out her episode on FIRE drill podcast. We talked to her for over 30 minutes so you’ll get a good sense of what the course might be like, when it opens again. Are you interested in taking a mini-retirement? Where would you go? I think of it as the realization that your career doesn’t have to be linear. You can take breaks between career opportunities to explore your passions, if you can fund it. 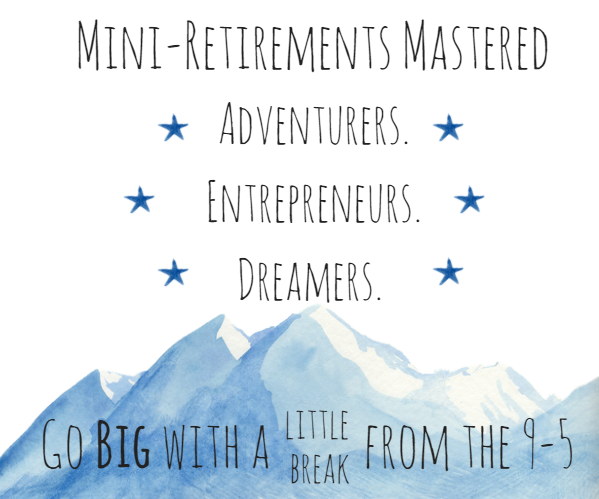 Planning a mini-retirement is 100x better than roses! =) The dreaming, planning and adventure of it all has done amazing things for our marriage as well. That’s the Tim Ferriss dream. Not everyone wants to build an online business but I think it’s one way to fund a mini-retirement. My wife and I took two mat leave/parental leaves together. It was essentially a mini-retirement (if you can count caring for a new baby retirement!). First leave was 3 months and the second was 7 months. It was awesome to take a break from the 9-5 grind. I remember seeing a TED talk about an ad agency that would shut down every 7 years to take 1 year off. Basically a year to be creative without constraint. Sounds like an awesome idea if you can pull it off. To tell the truth, J, I didn’t like your podcast with Jillian. Haha–it was too damn short! Jillian is a national treasure and I’m glad her mini-retirement course is now available. Anyone interested in a mini-retirement should definitely give it a look-see. Oh, and I would love to see you take a mini-retirement sometime in the future. You’re a blogging/podcasting dynamo now. I can’t imagine what great stuff you’ll do with more time on your hands. Cheers. Not quite a “mini retirement,” but I’m starting to love the idea of taking a month to live somewhere else – we don’t have any plans to move long term because our families are here and that’s super important to us with a small child, but the idea of having more than a week to really explore a place is really intriguing. Just last night I said to my partner that I need a summer vacation like we had as kids. I’ve signed up for this course and I’m excited to go through the resources. Thanks for sharing! I would love to do a mini-retirement. We are planning to start a family in the next couple of years, so I’m hoping maybe sometime between having kids and them starting school. My heart is in Europe, but I’d also love to see Southeast Asia. I would probably want to pick 3-4 places to stay in for at least a month each. I’m thinking about a mini retirement as we speak. I’m thinking about going to Germany for a while. I have so much plans for the future, especially for my kids. Definitely signing up for the course! So, is a mini retirement the same this as a sabbatical, except with a more relaxing connotation? Sounds fun!